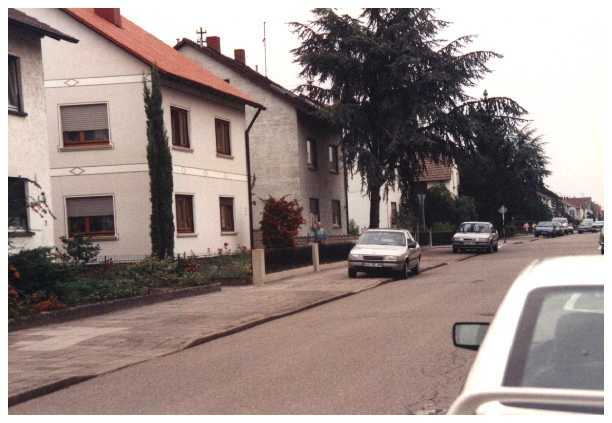 Wilhelm Meinzer's house at the left, with his wife Antonie waving at us from the yard. 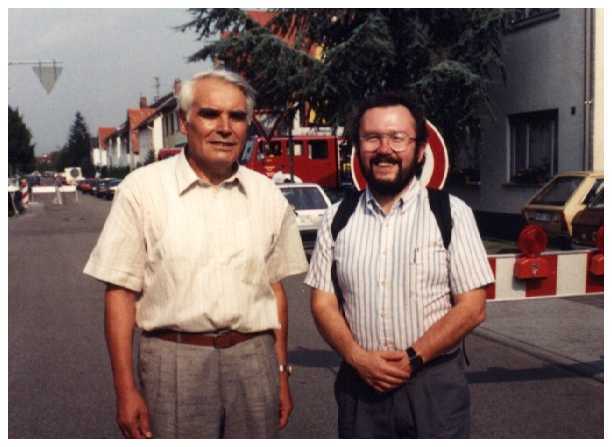 Wilhelm Meinzer (left) and Dennis Mansker, Neureut, 1991. 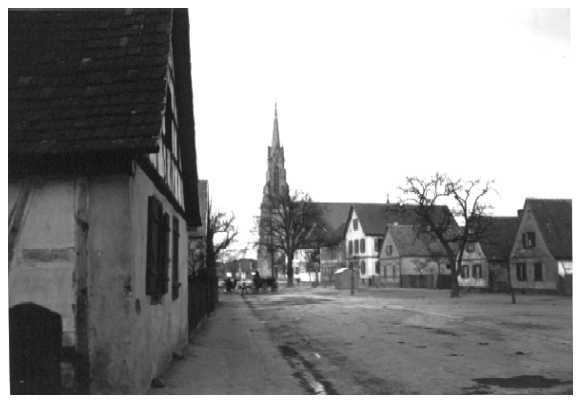 Herr Meinzer did some of the research that first cast doubt on Neureut being the place of origin of Ludwig Mäintzger. 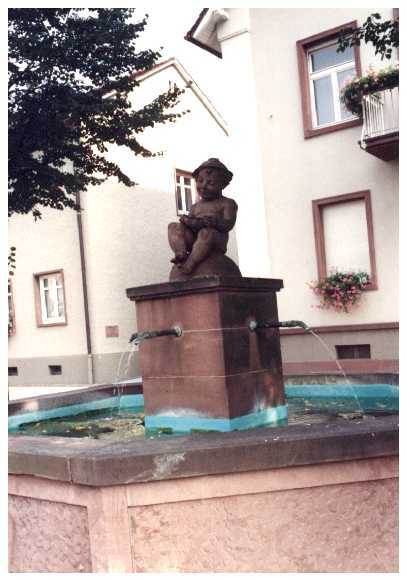 Der Spundenfresserbrunden, the Neureut town "mascot". This fountain was built on the site of the old village well, where the women used to come with their buckets and fetch water back to their houses. 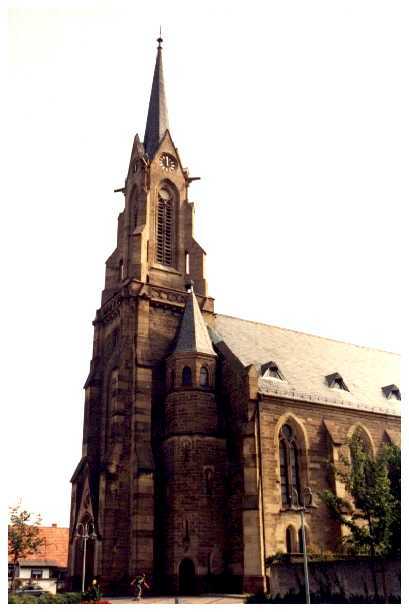 The Evangelical Pfarramt Neureut-Nord in Neureut. In the churchyard surrounding the building there were what seemed like hundreds of Meinzer graves. 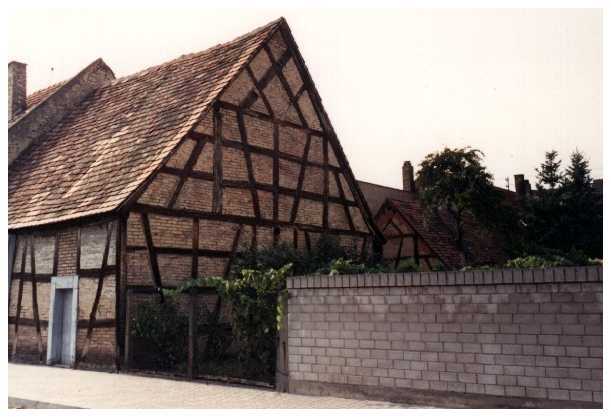 One of the oldest structures in Neureut, this house dates from the 1750s. Another house in Neureut. In the back are the old stables, now converted to garages or storage buildings. 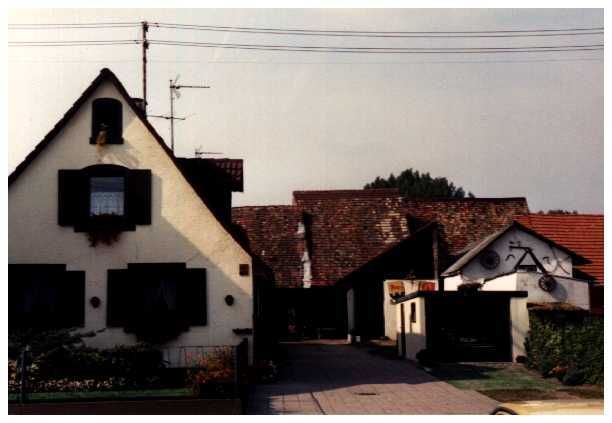 A house in Neureut, 1991. 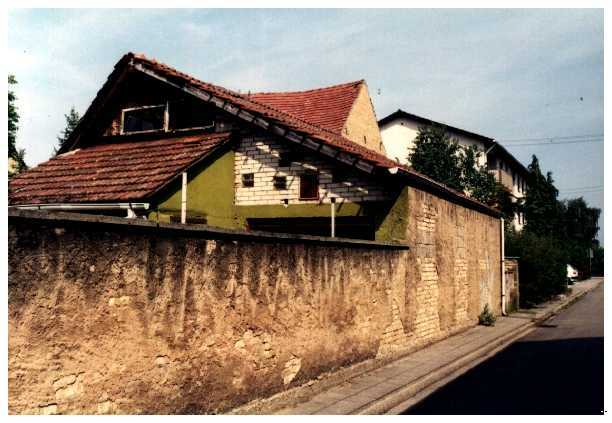 The wall is showing its age --probably two hundred years old-- but its surface is clean, without even a trace of graffitti. 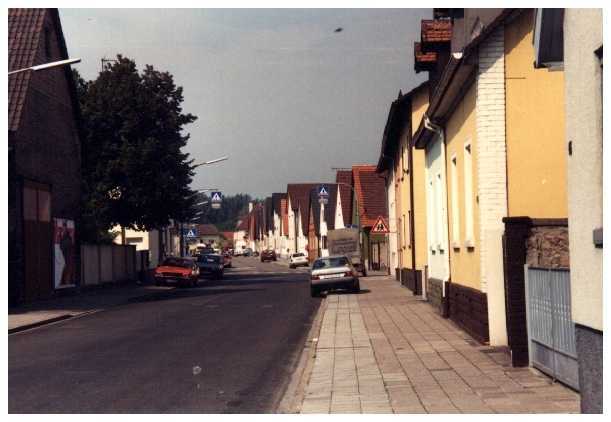 A street in Neureut, 1991. 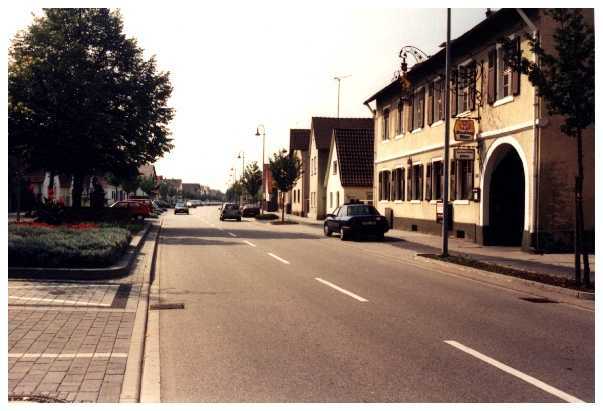 Neureuter Hauptstrasse in Neureut, 1991. Note how clean and tidy the streets are. By the way, that's an excellent restaurant in the building on the right. 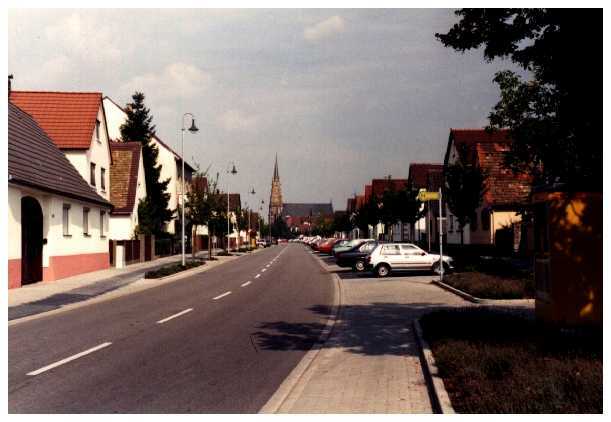 Neureuter Hauptstrasse in Neureut, 1991 with the Evangelical Pfarramt Neureut-Nord in the background. 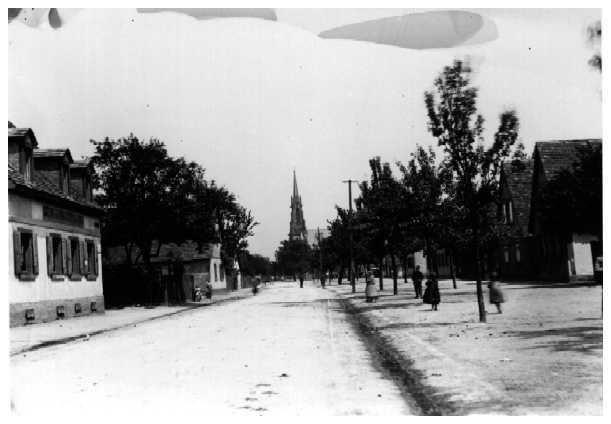 Neureut in 1910 with another view of the Evangelical Pfarramt Neureut-Nord. The Evangelical Pfarramt Neureut-Nord (the local Lutheran Church) is in the background.